Amazon has cut its cloud prices – but not far enough to bring the cost of using its online services entirely below that of rival Google. 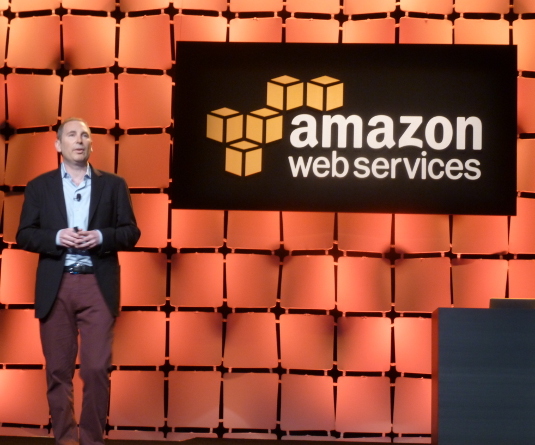 Prices for Amazon Web Services' mainstay S3 storage will fall by about 51 per cent, said the company's senior vice president Andy Jassy at the Amazon Web Services summit in San Francisco on Wednesday. This sounds impressive, but it is not enough to go as low as Google's $0.026 per gigabyte for mainstay storage or $0.020 for reduced durability storage. Amazon may have found its pricing floor. In addition, Amazon's mainstay compute prices will be cut by up to 40 per cent for older virtual servers, 30 per cent for the new C3 instances, and 38 per cent for M3 instances. In practice this means an M3.medium server instance on AWS, which costs $0.113 per hour, will fall to $0.070 per hour on April 1, putting it toe-to-toe with the new instance pricing of Google's n1-standard-1 instance. Along with this, prices for AWS's relational database service will fall by about 28 per cent, "SQL server will have comparable discounts as well," Elasticache costs will fall by about 34 per cent, and Elastic MapReduce will come down between 27 and 61 per cent. The prices will come into effect on April 1, 2014. "Lowering prices is not new to us," said Jassy. "This is something we've done now 42 times. You can expect us to do this periodically." Amazon's new position on pricing follows Google announcing a punishing price reduction on Monday at a packed event in San Francisco, California. Google reduced its pricing by up to 68 per cent for storage, 32 per cent for compute, and 85 per cent for data processing. This drastic cut put its on-demand instances ahead of those offered by Amazon, Microsoft, Rackspace, HP, and other rivals. Google also introduced a "sustained use" pricing model that saw it pass savings onto heavy users of its cloud. This compares with Amazon's reserved instances option, which can give significant cloudy customers big savings after they stump up a significant upfront cost. Amazon is yet to respond to Google's sustained-use pricing model – something of potential concern for heavy users of the cloud who can now go elsewhere for discounts, minus the upfront fee. "We've lowered our prices on 41 different occasions in the last few years largely in absence of any competitive pressure to do so," Jassy added. It appears Amazon has come down to Google's levels, though it is not quite at price parity with its arch-rival on a few key areas, such as storage where Google has rolled out a flat-rate pricing scheme and Amazon does tiered pricing. We'll be sure to bring you a more thorough analysis in a few hours. Amazon's price changes signal a new phase of competition among cloud computing companies. The online bazaar built its brand on the back of cheap prices, so for Google to go after its cloud business' margins is a significant strategic threat – one that merits a response. This follows years of sustained capital and technological investments by Google and Microsoft as both companies seek to grab a portion of the money flowing into Amazon Web Services. Both companies are dealing with problems rumbling through their core businesses. Google, for instance, has shuttered Google Reader, Wave and other services out of the blue, and performed pricing U-turns for its early platform-as-a-service Google App Engine. It has had to work hard to convince customers its public cloud products are not a temporary fascination but a serious long-term business. Microsoft, meanwhile, has the legacy of a lucrative software business combined with the taint of its prior fascination with proprietary technology. Customers are suspicious of its offering because they reckon it could squeeze them on price or make licensing difficult. Amazon, by comparison, has a core business – retail – that perfectly mirrors its ideal cloud messaging: cheap storage and compute sold with a high-turnover, relatively low margins, and a commitment to the customer and market growth as the ultimate route to success.